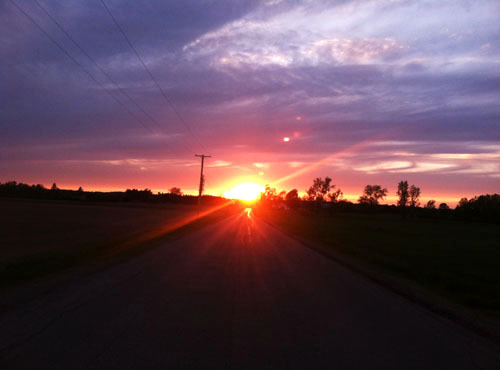 File photo by Tom Rivers: A road in rural Barre is pictured at sunset in this photo from May 21, 2015. Orleans County has about 3,600 households without access to high-speed Internet, but that number would shrink to 77 as part of the Charter Communications and Time Warner merger. Charter Communications has to make broadband Internet access available to an additional 145,000 homes and businesses in new York over four years as part of the merger. Charter’s plan would nearly cover the remaining gaps in Orleans, leaving 77 households without access. Charter would also make significant improvements in Niagara County, reaching all but 943, with most of those gaps in rural eastern Niagara County. Orleans and Niagara officials have been working together the past four years to bring more high-speed Internet to the two counties. The state announced a $500 million broadband push last year, but Orleans and Niagara held off from applying because they wanted to see what Charter’s plans were for the two counties. Johnson and Godfrey say the remaining unserved areas after Charter’s work may be too small to get a vendor to step in and provide the service. The state funds, and possibly federal money being pushed by Sen. Kirsten Gillibrand (D-NY), may be able to reach the last mile so the entire counties are covered. Johnson is pleased Charter has Orleans in its build-out plan. She believes about four years of work, of identifying unserved households and pressing the state and federal government about the lack of high-speed Internet, paid off with Charter putting Orleans among the 145,000 to be served. The state and industry maps for service were wrong before, Johnson said. The state and broadband companies had said 97 percent of Orleans was covered. But local government officials and a consultant went house to house and identified a much bigger unserved population – about 3,600 of the approximately 20,000 households in Orleans didn’t have access to high-speed Internet. The four villages – Albion, Holley Lyndonville and Medina – all have 100 percent access. But out in the country it’s a different story. There are entire segments of some rural roads with no high-speed Internet access. Orleans officials will be meeting with Charter later this month to discuss the build-out. Johnson will urge the company to fill all of the missing gaps. She also wants Orleans to be early in the build-out that will be spread over four years in the state. “This is truly a win for the two counties,” Johnson said. Godfrey also is pleased with the plan for more service in Niagara. “It’s quite amazing how much they will do,” he said. Photos by Tom Rivers: Pride Pak has been praised for the appearance of its new vegetable processing site on Maple Ridge Road in Medina. MEDINA – Fred Miller worked at Lipton in Albion as a young man. The plant closed in 1980, putting hundreds of people out of work. Miller would go on to run a hardware store in downtown Albion. He also is an Orleans County legislator. Robert Chapman, Pride Pak’s vice president of sales and marketing, welcomes about 300 people to the ribbon-cutting and opening celebration for the company’s new facility in Medina. Chapman credited CEO Steve Karr, lower left, with pushing the project to completion. 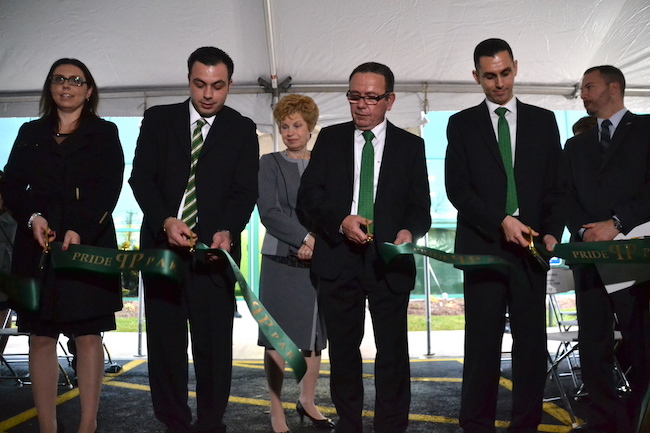 On Wednesday he attended a ribbon-cutting ceremony and tour of the new Pride Pak vegetable processing site in Medina, a 68,000-square-foot building. Pride Pak has plans for expansion, with two more similar-size buildings. Seeing the building stirred memories for Miller, of the busy Lipton plant that provided jobs for hundreds of working class families. Pride Pak was looking at the former Bernz-O-Matic site in Medina, but decided to build new on Maple Ridge Road. The new facility didn’t need a costly retrofit and the site has room for the future expansions. Steve Karr, Pride Pak CEO, said the company didn’t go cheap with the new building. It wanted an attractive facility on an important gateway in the Medina community. Steve Karr, company CEO, thanks the Medina community for a warm welcome for Pride Pak. Mike Sidari, the Medina mayor, thanked Karr and Pride Pak for such a nice addition to Maple Ridge Road. Not only will the company employ up to 300 people at full build-out, but it added a beautiful site on a busy corridor, Sidari said. “It’s an inviting building as you come into the village,” Sidari said. The grand opening celebration on Wednesday included fancy hors d’oeuvre appetizers, and local beers and wines, as well as a band playing. 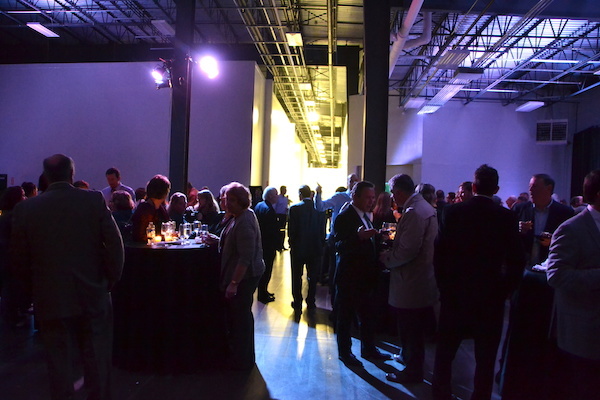 A warehouse was turned into a room for fine dining. Ortt said Pride Pak’s decision to build its first U.S. facility in Medina shows that rural Orleans County welcomes business. 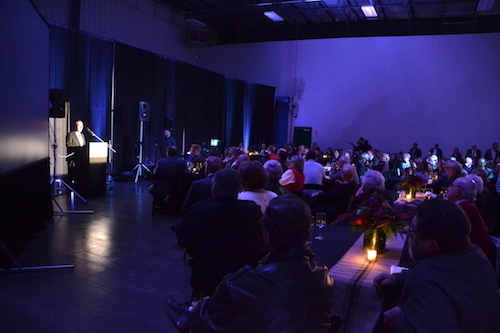 Warehouse space in Pride Pak was transformed for a festive celebration on Wednesday. Pride Pak has one packing line in place and is working to get more on line. The packing equipment allows the company to double the rate of trimming, cleaning and packing vegetables for the salads. Medina, the Town of Shelby, Orleans County and Empire State Development all worked to provide incentives for Pride Pak, and to get infrastructure in place for the new building and the future expansions. Steve Karr thanked the government officials for their work with the project, which is about a $20 million investment for phase 1. Steve Karr, the Pride Pak CEO, is pictured in overalls in mid-October when he was working with contractors helping to measure and connect lines that day. He is pictured in the warehouse space, which was the scene for an upscale party on Wednesday. Karr said about 50,000 man hours went into the facility’s construction. He has been working 80 hour weeks in Medina to move the project along. He was wearing a suit on Wednesday for the grand opening. But much of his time the past year was in overalls, helping with construction projects at the site. Karr’s work ethic is legendary at the company. Robert Chapman, Pride Pak’s vice president of sales and marketing, said Karr’s determination made the ambitious project a reality on a tight schedule. Photos by Tom Rivers: Members of the Karr family cut the ribbon this afternoon for Pride Pak’s new 68,000-square-foot vegetable processing and packaging plant in Medina. Steve Karr, fourth from left, is the company president and founder. He is pictured with his children, from left: Jennifer Pappas, quality director; Angelo Karr, vice president; Steve Karr’s wife Elsie (in back); Steve Karr; Greg Karr, vice president of procurement; and State Sen. Robert Ortt. 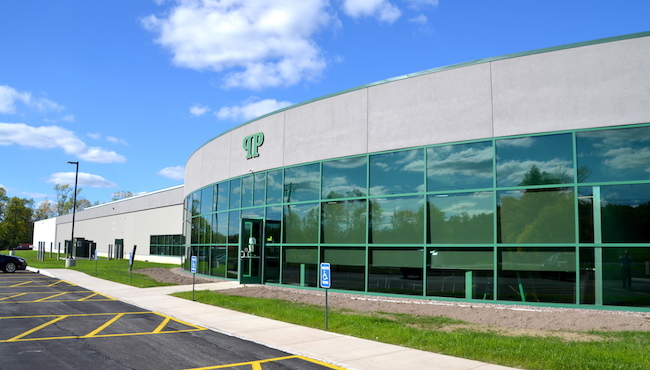 MEDINA – Empire State Development announced today that Pride Pak, Inc. has opened the doors on its new 68,000 square-foot facility on 13 acres in the Medina Business Park. 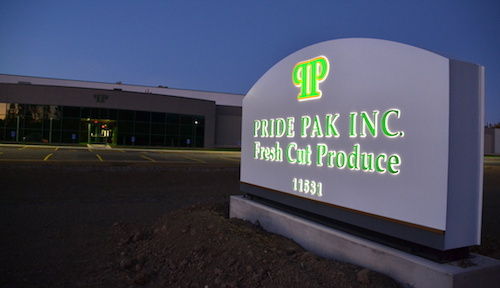 Pride Pak, Canada’s largest fresh fruit and vegetable processor, will ultimately invest up to $30 million on the state-of-the-art complex in Orleans County in order to be closer to its U.S. customers. The company has committed to creating 200 new jobs at the site. The Governor announced Pride Pak’s plan to build in the Finger Lakes region last November. The new Pride Pak is pictured in the evening last month. The site currently has 40 workers and could reach 200 when the the company is at full build-out with two more buildings. 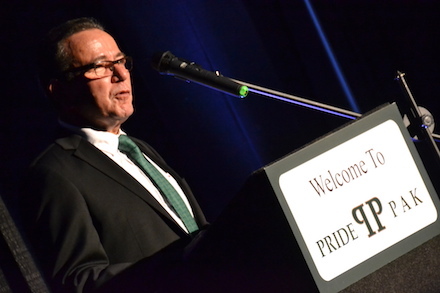 In 1984, CEO Steven Karr started Pride Pak Canada, Ltd. in an effort to service what he saw as Canada’s growing demand for high quality, easy to use fresh food. Expansion in to Newfoundland in 2006 established Pride Pak as the industry leader in the value-added produce industry. The company’s long-standing relationship with Wegmans Food Markets was the stimulus for Pride Pak’s move to the U.S.
As the industry leader in organic and conventional value-added produce processing, Pride Pak Canada currently exports 35 percent of its product to the U.S. All of Pride Pak’s produce is packed fresh, not frozen. They provide fresh-cut fruits and vegetables and specialty salad blends to food service operations and retail establishments, including Wegmans Food Markets, Inc. Phase One of Pride Pak’s Medina operation will be dedicated to the production of organic baby salad green blends, expressly for Wegmans. Karr says Phases Two and Three will include the addition of conventional fruit and vegetable processing, with the company sourcing carrots and other root vegetables from local farm operations. When fully operational, Pride Pak expects about 45 truckloads of produce each month. The organic vegetable by- product, about 220 tons monthly, will be delivered to local livestock farms and used as animal feed and fertilizer. 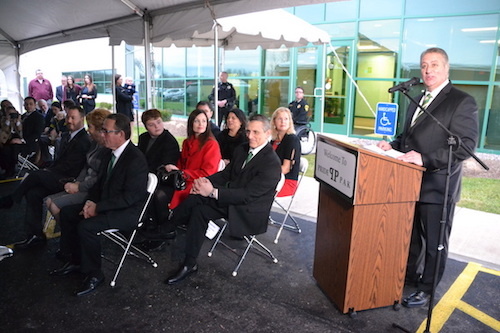 Steven Karr, company founder and CEO, addresses about 300 people who attended a ribbon-cutting ceremony and then celebration inside. Canada’s largest fruit and vegetable processor chose to locate their U.S. headquarters in the Finger Lakes region thanks to Governor Cuomo’s emphasis on Upstate revitalization through the Finger Lakes Forward strategic plan and through other local support efforts. Empire State Development, provided up to $2 million in Excelsior tax credits in return for job commitments to move the project forward. The New York Power Authority also provided an allocation of low-cost hydropower to Pride Pak in return for job and capital investment commitments. The Town of Shelby also received a $750,000 award from the New York State Office of Community Renewal to assist Pride Pak. Pride Pak is currently accepting job applications and those interested can apply directly at Pride Pak or through the Orleans Center for Workforce Development in Orleans County. 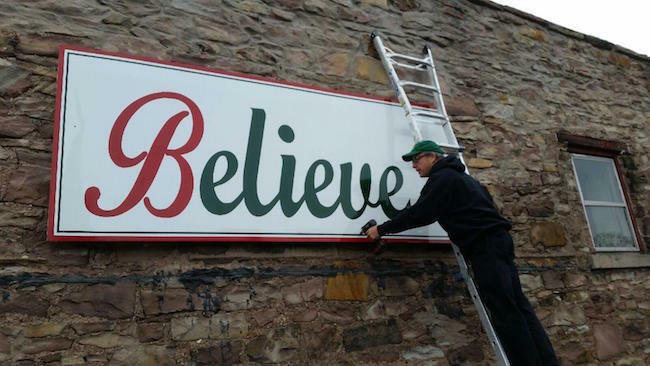 Photo by Colin Downey: Bill Downey of Downey Signs in Albion installs a new 4-by-10-foot sign in downtown Albion this afternoon. The sign is on the Gurney’s Olde Coach Inn at 35 North Main St. The Albion Betterment Committee pushed for the sign and paid for the project. 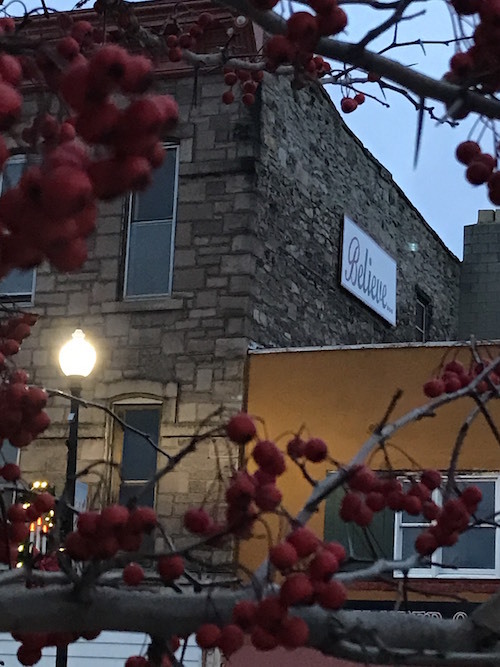 The Betterment Committee wanted to spruce up a spot where there was a faded sign and promote an optimistic message about Albion. The group also wanted the the sign to tie in with its efforts for a Charles Howard memorial in downtown Albion. Howard was the founder of a Santa Claus School and Christmas Park in Albion. The Betterment Committee is trying to raise funds for that project, which would include a bronze statue of Santa and perhaps Howard together. Photo by Tom Rivers: Here is how the Gurney building looked in September. The sign advertised the Olde Coach Inn. Photos by Marsha Rivers: Downey and his grandson Colin put up the new sign this afternoon. The message of the sign is open to interpretation by each person. 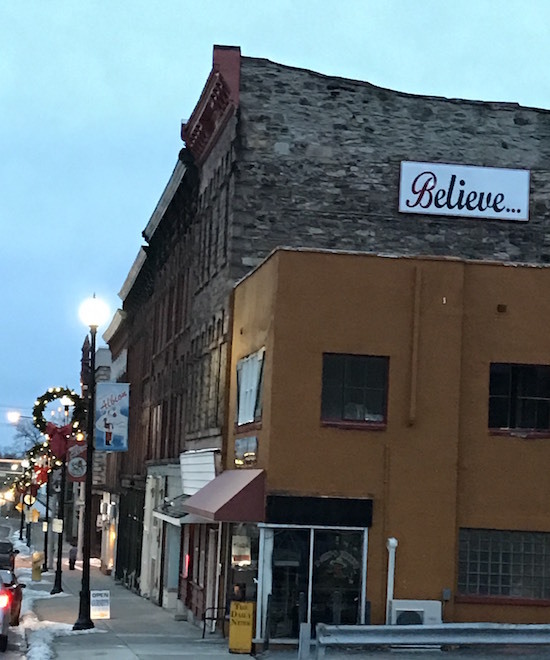 It may mean to believe in themselves, Albion, Santa, God, or maybe even in the Buffalo Bills making the playoffs. This is the third sign the Betterment Committee has erected in Albion in the past 12 months. Last December it had a sign put up on Route 98 noting Albion as the home of Charles Howard, the Santa School founder. The Betterment Committee also replaced the sign this year on the former Santa Claus School at the corner of Route 31 and Gaines Basin Road. For more on the Albion Betterment Committee, click here. 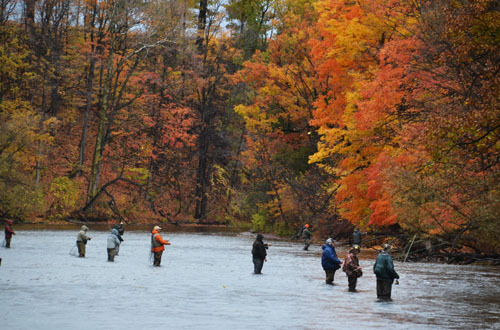 Photo by Tom Rivers: The St. Mary’s Archer’s Club on the Oak Orchard River in Carlton attracts many out-of-state fishermen each fall. This group is pictured on Oct. 29, 2015. Fishing is the county’s leading tourism draw, accounting for about half of the $24 million total. ALBION – Tourism is big business in New York State, generating $63.1 billion in visitor spending in 2015. Many counties, including some small ones, bring in well over $100 million in tourism revenue. 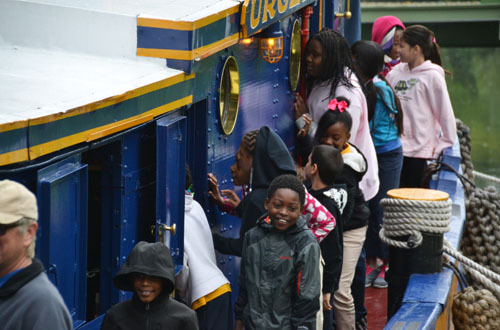 But no county brings in less than Orleans, which totaled $24.421 million in visitor spending in 2015. That is dead-last among the 62 counties in New York State, and about $4 million less than the 61st-ranked county, Chenango, at $28.455 million, according to a report by Tourism Economics and Empire State Development. Orleans County certainly has assets with Lake Ontario, the Erie Canal, numerous historical sites and community festivals and events. The county is hurt by not having an established chain hotel. That limits many visitors to day trips where they don’t stay overnight, minimizing some of their economic impact. The Orleans Economic Development Agency has been reaching out to hotel providers, and is hopeful a new chain, Cobblestone Inn and Suites, will commit to a site in Medina. The EDA commissioned a study by Interim Hospitality Consultants, and that report concluded Medina could support a small hotel with 41 to 49 rooms. Jim Whipple, the chief executive officer of the Orleans EDA, said investors haven’t committed to the Medina project yet. The EDA razed a house next to the new Pride Pak on Maple Ridge Road and installed infrastructure to make the site more attractive for developers. 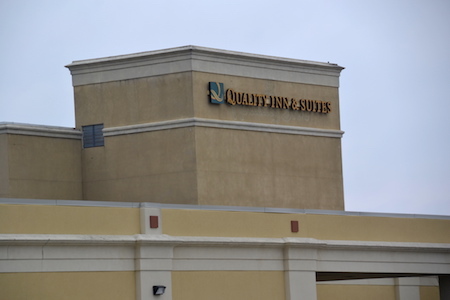 Batavia is home to several chain hotels, including the Quality Inn & Suites. Genesee County has about 1,000 hotel rooms. If a chain hotel comes to Orleans it would help capture more visitor spending, and also boost the “bed tax” leading to more money for marketing the county. 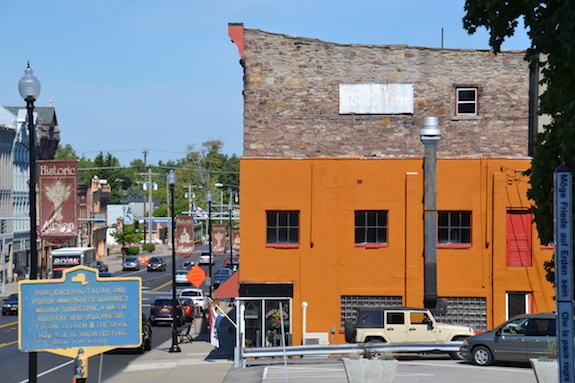 The bed tax raises about $35,000 annually to promote tourism in Orleans County. That 4 percent tax is charged by motels, bed and breakfasts, vacation rentals and lodges. In neighboring Genesee County, there are nearly 1,000 hotel rooms along the Thruway corridor. They generate more than $400,000 a year to promote tourism, drawing more visitor spending to Genesee, where direct tourism spending totaled $93.360 million in 2015. The county also secured a grant for a study of assets and opportunities along the 25 miles of Lake Ontario shoreline in the towns of Yates, Carlton and Kendall. Representatives from those three towns and the county are working to update a plan to better capitalize on the lake. The state is also planning to pave some sections of the Lake Ontario State Parkway, from Route 237 in Kendall headed east. The deteriorated condition of the Parkway has discouraged many motorists, especially those with RVs, from using the road. Fishing is the county’s leading tourism draw, accounting for about $12 million in direct visitor spending or about half of the county’s total tourism spending. Callard thinks fishing could bring in more money, especially with amenities in place for wives and children of many of the anglers. Fourth-graders from School No. 2 in Rochester visit the Urger, a historic tugboat, on Oct. 7, 2015 when the vessel was in Holley. Callard would also like to see the canal communities work together to develop a comprehensive plan for enticing more visitors to Medina, Albion, Holley and the canal hamlets. “We have to do smelting bigger and better to attract people,” he said. • Oneida, $1.308 billion; Erie, $1.676 billion; Westchester, $1.793 billion; Kings, $1.975 billion; Nassau, $2.532 billion; Suffolk, $2.951 billion; Queens, $8.308 billion; New York, $29.968 billion. File photo by Tom Rivers: Ward Dobbins is pictured inside H.H. Dobbins in this photo from September. Dobbins is working on a 10,300-square-foot expansion to accommodate a larger packing line. 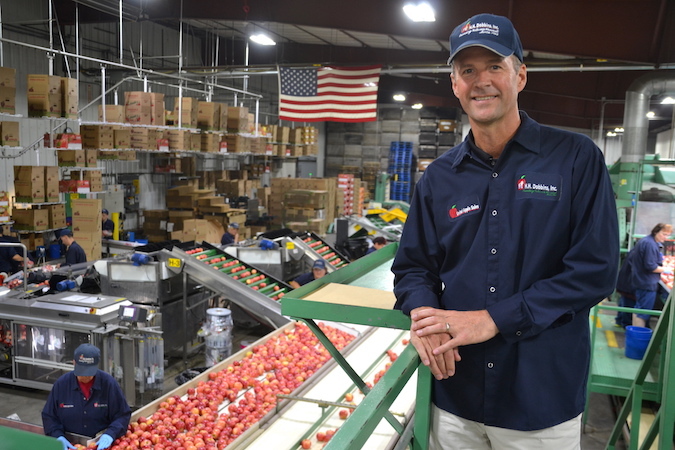 LYNDONVILLE – A business that packs about 1 million bushels of apple each year is moving ahead with a $5 million expansion that will include a new packing line with the latest technology. H.H. Dobbins (Empire Fruit LLC) will put a 10,300-square-foot addition on its complex at 129 West Ave. The added space will accommodate a new state-of-art packing line that can detect internal and external blemishes on fruit. Dobbins said the new line won’t displace workers. They will instead be packing boxes and bags of fruit. The new line will increase the volume from 140 bushels packed per hour to 900 bushels, Dobbins said. The expansion project is estimated to cost $5 million for the new equipment, machinery, fixtures and furnishings, as well as construction of the new space. The Orleans Economic Development Agency has approved a sales tax abatement that will save H.H. Dobbins $220,864 in sales tax. That is an exemption on the 8 percent tax on an estimated $2,760,800 in taxable purchases of equipment and materials. The EDA board of directors approved the incentive on Nov. 10. That is the only tax break Dobbins will receive from the EDA for the project. The company isn’t pursuing a property tax discount with the project. This is the second recent significant expansion and investment by Dobbins. The business last year opened a new 26,240-square-foot controlled atmosphere storage building on Millers Road, about 2 miles from the main packing house on West Avenue. That $3.4 million project boosted Dobbins’ on-site storage by 300,000 bushels of apples. The CA also acts to put apples “to sleep,” allowing them to be stored for many months, sometimes up to a year. H.H. Dobbins was started in 1905 and under the leadership of the fourth-generation owner, Ward Dobbins. Dobbins is working to have the new packing line in production by next harvest season, EDA officials said. 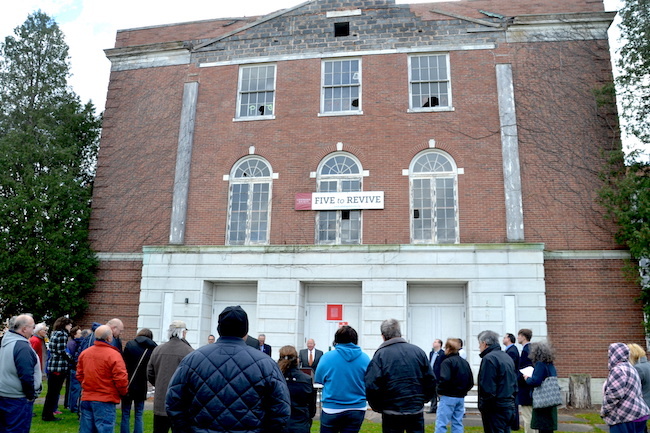 Photos by Tom Rivers: Nelson Leenhouts, chairman and CEO of Home Leasing, addresses a crowd this morning outside the former Holley High School. Leenhouts wants to redevelop the site into senior apartments and the village offices. HOLLEY – Calling it the lynch-pin to re-development of the old Holley High School, U.S. Senator Charles Schumer this morning announced that he will work to secure $3.7 million in housing and historic preservation tax credits for developers of the proposed Holley Gardens, a $17 million redevelopment project. 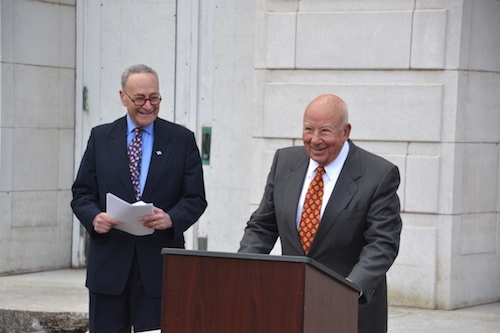 Schumer spoke in front of the school located in the center of the Village of Holley, and called the plan to create 41 mixed-income apartments for seniors, new village office space, and restore the auditorium for public events, “a labor of love,” by developer Nelson Leenhouts, chairman and CEO of Home Leasing. “He is doing this because he cares,” Schumer said. Nelson Leenhouts, chairman and CEO of Home Leasing, and U.S. Sen. Charles Schumer want to see the old Holley school repurposed for housing and offices. Leenhouts said in his 49 years of real estate development he has never had a community work so hard to make a project a reality as the redevelopment of the old school. The school was built in 1931 and closed in 1975. It was used by Liftec Manfacturing until the company went bankrupt about two decades ago. 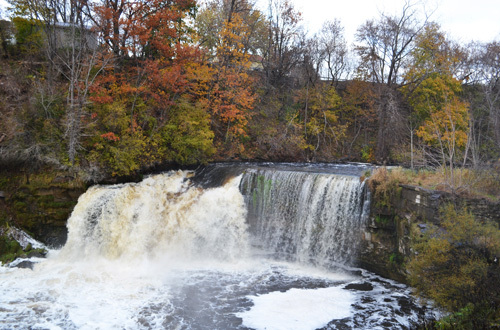 The senator noted the project now needs a federal investment and is urging the National Park Service and its partner agency, the NYS Office of Historic Preservation, to approve $3 million in federal Historic Tax Credits. Additionally, Senator Schumer is urging the NYS Department of Homes and Community Renewal to award $700,000 in federal Low Income Tax Credits that the state receives from the U.S. Treasury Department to assist developers. Schumer said the tax credits will leverage $7.1 million in private investment as part of the overall $17 million redevelopment plan. The project is expected to create 64 construction jobs during the 15-month construction period and two full-time jobs after construction. Local and county officials attended the announcement including Village Trustee Kevin Lynch, Orleans County Legislature Chairman Dave Callard and County Legislator John DeFillipps. Holley Mayor Brian Sorochty introduced the senator and thanked local officials including Assemblyman Steve Hawley and Senator Schumer for their efforts on behalf of the project. Leenhouts of Home Leasing said he would like assurance on the tax credits in December, so the company can begin preparing for construction to start late next year. 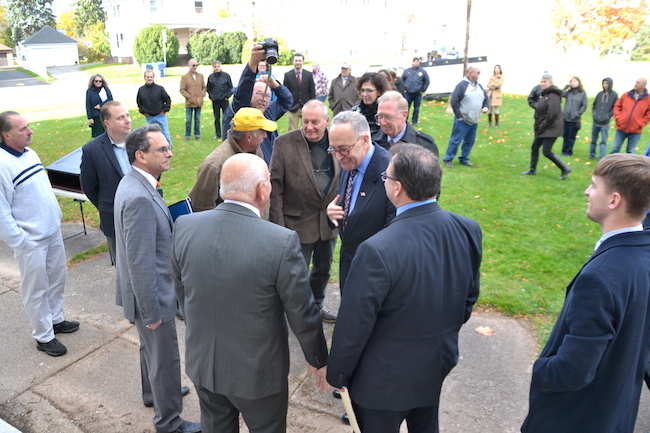 U.S. Sen. Charles Schumer meets with local officials and people working on the redevelopment of the old Holley High School today on the front lawn and steps of the historic school. Schumer said the tax credits for reviving historic properties can make the projects financially viable, and return important properties as community assets. 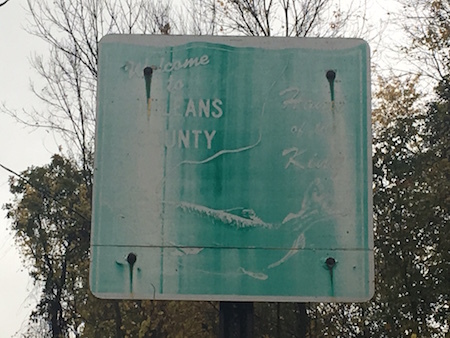 This washed-out sign declaring Orleans County as “Home of the King” with a faint outline of a salmon greets motorists on Route 98 near the Elba-Barre townline. The county could do much better with gateway signage highlighting local attractions. Orleans County and the local school and village governments have all been in shrink mode in recent years, making big reductions in staff. The county sold the nursing home, and many of its departments have fewer employees than a decade ago. Villages have fewer police officers and DPW staff. In some cases, the municipalities are sharing staff to bring down costs. Orleans and Genesee counties have teamed up to have Public Health employees working in both counties. Holley has contracted with Albion for police chief services and for expertise running its sewer plant. The officials have found ways to reduce the overall government overhead. But there is another way to bring down property taxes, a way that would lift up local businesses. The local governments should look to boost sales tax revenues in the county. There should be a push to have Orleans residents spend more within our county, and there should be a concerted effort to bring in more visitors. Right now, Orleans County ranks as the fourth worse out of 62 counties in sales tax per capita, despite ranking 25th from the bottom in median household income. Orleans gets $358 per person in sales tax. We are one of only six counties below $400 per person, according to the Office of the State Comptroller. Wyoming County, which is similar in size to Orleans at about 40,000 people, gets $394 per capita in sales tax. Orleans County, population 42,235 in 2013, took in $15,469,950 in sales tax in 2015. There was $15,703,363 in 2014. Wyoming County, population 41,531 in 2013, took in $16,591,138 in 2015 and $16,853,447 in 2014. 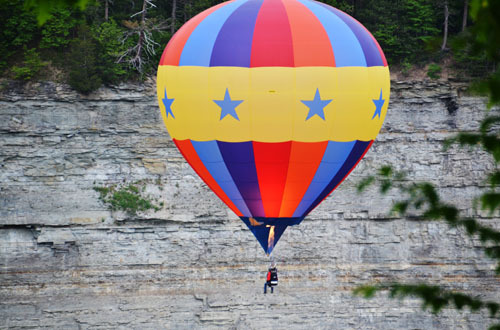 A hot air balloon takes off at Letchworth State Park in this photo from May 2015. Wyoming County has numerous signs in many towns pointing people to the park. I often hear people say Orleans is the poorest county in the state. That isn’t true. Our median household income is $48,502. There are 62 counties in New York and Orleans ranks 25th worst (or 37th highest) in median household income, according to the Census Bureau. The Census compiled the data in household income from 2009-2013 in the American Community Survey. In Western New York, Orleans tops Niagara County ($47,955), Allegany ($42,429) and Cattaraugus at $42,603. Wyoming has a higher household income than Orleans. Wyoming is 34th out of 62 counties at $51,100. A reasonable goal with sales tax for Orleans would be to match Wyoming. Orleans would need to bring in about $1.1 million more a year. Although Wyoming has a higher median household income, Orleans has slightly more people. I would like to see our elected officials launch a campaign to boost sales tax to $17 million in 2017 and to $20 million by 2020. Every $1 million in sales tax represents $25 million in taxable spending. We lose a lot of sales tax because our gas prices are higher than neighboring counties. Meeting with gas providers, explaining how their prices hurt us and drive up taxes, may get some relief. Educating the consumer may be best bet to capture more sales tax from gas sales. Consumers may not realize when they buy gas in Elba, Brockport or Lockport, they are depriving their own municipality of that revenue. If they buy 15 gallons a week outside Orleans (with the county losing about 8 cents in sales tax per gallon) that’s $1.20 lost each week or $60 for the year. Multiply that by thousands of people. 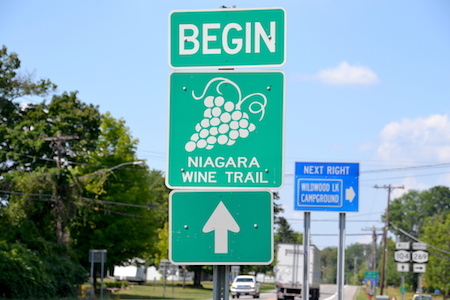 It was a big deal about two years ago when the state allowed the Niagara Wine Trail to extend past Niagara County through Orleans, all the way to near Rochester. The state even provided money for road signs. But the local wineries and Niagara Wine Trail have struggled with getting permits and approvals for the signs. This photo shows the sign on Route 104 near the Niagara-Orleans border. Route 98 corridor from Batavia to Point Breeze (several museums on this stretch). Add bronze statues/memorial sites in Batavia (for horsemen at Batavia Downs) in Elba (for muck farmers) and in Albion (for Santa and/or quarrymen). Promote and better develop an Albion Heritage Trail that ties together the historic sites at Mount Albion Cemetery, Courthouse Square, downtown, Erie Canal, and Cobblestone Museum as well as many grand old homes. Partner with Niagara and Monroe counties to establish and promote Cobblestone Trail on Route 104 with Cobblestone Museum the centerpiece. As the county nears its 200th anniversary in 2026, the local officials should be mulling ways to celebrate that milestone. Perhaps the quarrymen memorial and other tributes would be attractions while paying homage to our heritage. Holley has the only original section of the Erie Canal remaining from between Buffalo and Rochester. A humble sign nailed to a tree notes that distinction. 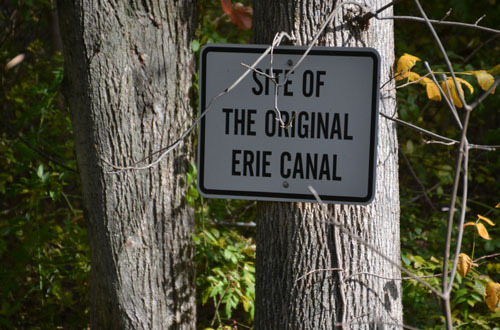 Holley has the only remaining original loop of Erie Canal. It is currently filled with wild brush and vegetation. If it was cleared out, with interpretive signage, it could be an attraction. There are many other historic assets, from cemeteries, stately homes and historic districts. A package could be developed to capitalize on the interest in history and heritage. Orleans County has many stories to tell from the war of 1812, Erie Canal, Underground Railroad, industrial revolution (Medina sandstone quarries) and much more. Some of these sites could be connected through hitching posts and carriage steps, especially if someone provided carriage rides to see the historic trail. Work to obtain a Pullman Sleeping Car that would be parked in Albion and rented out to coffee shop/bakery. As part of the 200th anniversary of the Erie Canal construction, Orleans County and the canal towns should try each year to introduce a painted fiberglass mule and oxen. They could be gradually introduced over the eight-year bicentennial which starts next year and ends in 2025. The county may want to work with GO Art! and contribute some funds to the effort. Numerous communities have done these type of public art projects, including Batavia, Buffalo, Rochester and Olean, just to name a few. The Medina Waterfalls is an awesome site, but it’s largely inaccessible to the public. Medina has one of the most impressive waterfalls along the canal, but it is largely inaccessible to public. Having an elevated platform from canal leading back to waterfalls would put an attraction in play, drawing more people to Medina. There is also a nice waterfall in Shelby. If pubic access was secured, it would be a nice spot for families and others to enjoy. Provide some funding for bronze statues for Company F Memorial in Medina and Charles Howard in Albion. Both would provide an iconic character for their communities. 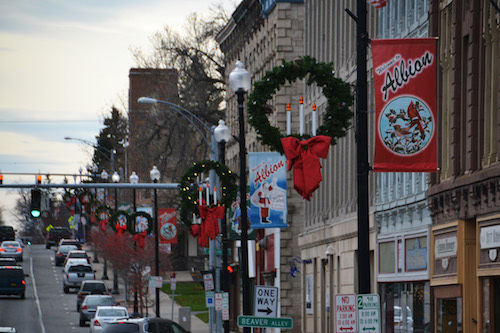 The Howard statue of a Santa would promote Albion’s Santa history and could spur the downtown to become home to Santa-themed businesses (The Santa Café and Bake Shop, for example). Set aside $50,000 annually from the $200K-plus in gambling money (as part of the state settlement with the Senecas) and use it to make local festivals better and to support projects, such as bronze statues, better gateway signage, etc. 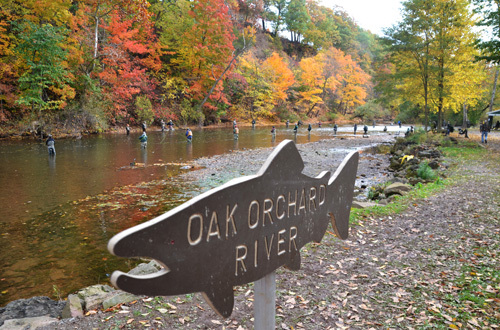 Fishermen try to catch salmon and trout along the Oak Orchard River last October. Orleans gets about $12 million in spending from fishing. That’s a far cry from the $100 million up in the Oswego area with the Salmon River. We could do more. I would start with better gateway signs at the county borders. The current ones that say, “Home of the King” with a salmon are washed out and unnoticeable. Dramatic signs that say, “Catch me if you can,” might reel in more fishing cash. The county should form a sales tax commission or task force that would work with the town and village governments, as well as the Chamber of Commerce and business associations to have an action plan for putting more assets in play that would bring more visitors to the county and also encourage Orleans residents to spend more locally. That would grow the sales tax, reduce pressure on property taxes, and stimulate local businesses. YATES – A Canadian-based company that acquired the former Atwater Foods building on Route 18 in Yates was approved for a $150,000 low-interest loan today by the Orleans Economic Development Agency. Niagara Food Specialties is a meat processor for gourmet markets, including restaurants and hotels. It specializes in prosciutto ham. The company formed in Canada in 2001 and is based in Niagara Falls, Ont. Niagara Food is moving its meat processing, salting and aging lines from Ontario to Yates. It is upgrading the former Atwater site, and will use the $150,000 loan for new machinery and equipment, EDA officials said. The company is to pay back the loan over 66 months at 75 percent of the prime rate, current 2.625 percent. The company is investing about $3.5 million total in the Yates site, a 51,000-square-foot facility. It is projecting to have 18 ½ employees in Yates, said James Whipple, chief executive officer for the Orleans EDA. 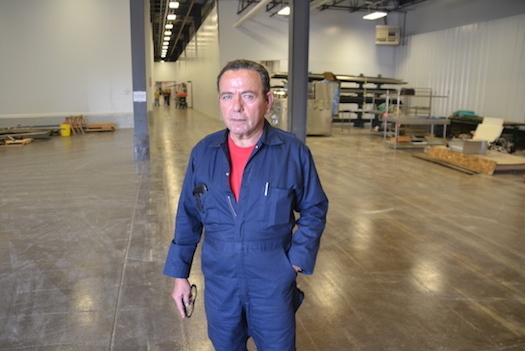 Niagara Food co-owners and brothers Mario and Fernando Pingue looked at other sites for the project, including locations in Ontario and Michigan. The Yates site will allow the Pingue brothers to increase production, introduce new products and bring efficiencies to its production process. Niagara Food Specialties also has been awarded a $100,000 capital grant from Empire State Development. The Town of Yates also has applied for $250,000 in Office of Community Renewal funding to assist the company.